Delirious Documentations: To What Are You Allegiant? I also have a confession to make about spoilers: I was online, looking at reviews of one of the movie books to see whether or not I wanted it. At this point, I had either just finished the first book or started the second. And there someone very rudely shouted out a spoiler in one of the reviews (of a movie books, too, where something that happens in the third book is completely irrelevant): this person was saying not to bother reading the trilogy because Tris dies. I was shattered that this person had ruined for me the experience of reading it for myself. I had never received a spoiler like that. I was so late coming in to Harry Potter, for instance, and yet I hadn't had any spoilers on that story. So I was shattered by getting this one. The thing is, it might not have been as bad as it could have been. I wasn't sure if this person was lying or taking something out of context, so I kept running through scenarios in my mind, imagining how the story might end and what sort of instance would have Tris die that would still fit in with the themes. When I first read that review, I didn't know if I trusted Veronica Roth yet; I didn't know what kind of storyteller she was. But the more I read, the more I began to trust her--in terms of theme, that is. And so I knew that if Tris died, it would make sense for the story and for the theme. So I kind of had time to prepare myself--and perhaps that was a good thing. I wasn't expecting some sappy happy ending where everyone waltzes off into flower fields (I have nothing against happy endings, but not every story needs to end with flower fields); so I was ready for something deeper. And can you really imagine this story ending any other way? Back when I had only watched the movie, I said that I appreciated that there was a love story without the love story being the only thing that is important. And if the plot had been designed so that Tris and Tobias could have had a happy ending together, then the implication would have been that that was the most important thing. Romantic love is great, but it isn't the only aspect of life that has power. Tris dies for a cause (so that the people living in the city she has always called home can be free) and for her brother (because he is her brother and she loves him and she doesn't want him to end his life with nothing but regret and the desire to escape). It's beautiful irony: because Tris has finally come to love life, she is also capable of being ready to die. When she had nothing to live for, she had nothing to die for, either. Now she has both. Her life is like the story. When her story is complete, then the books can end. When her life is completed, it also comes to an end. And now there are no if's. There is no wondering what if this or that happened in the city, what would Tris do then? There need to be no more books about Tris because her story has been told--and it was a good one. She lived a full life, learning and experiencing and choosing and doing. And making an impact on her world. There we come to Tobias. Even without the spoiler, I would have suspected that Tris would die because of the sudden inclusion of Tobias's perspective. 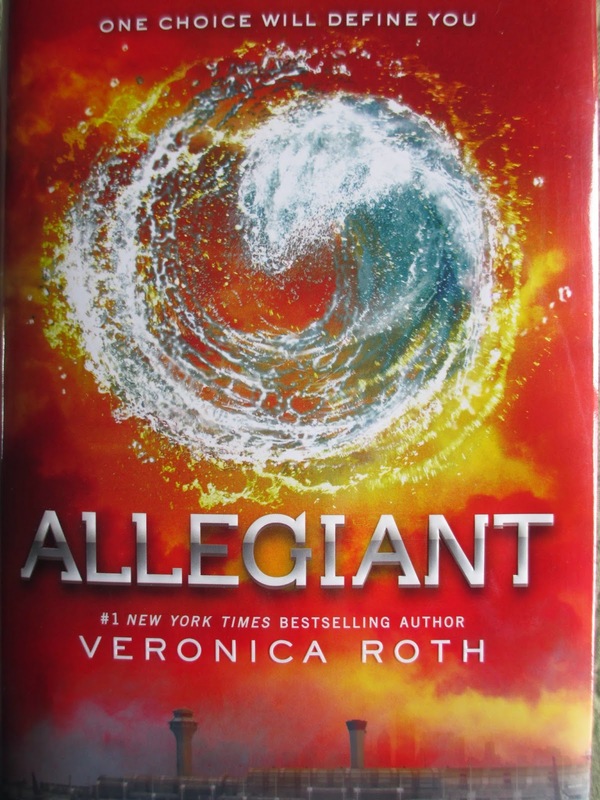 If I had a minor complaint about Allegiant, it would be that there is nothing very distinguishable (other than plot and perspective) between Tris's narrative voice and Tobias's. A couple times I forgot whose section I was reading until something practical reminded me (Tris referring to Caleb as her brother or something like that). But I don't like these books for the way they're written (syntax, diction, etc.). I like them for the characters and the themes. And the way that Tris's significance as the central heroine fades into Tobias's place as the surviving character is . . . beautiful. I love this theme about the impact people have on each other, about how just knowing a person (even for a short while) can change who you are. Tris basically had a coming of age story, again and again: she's constantly learning or realizing new things and reacting to them. But Tobias is a little different. What he needed was to let go of certain things in his past and to accept certain things about himself so that he is able to move on and be all that he can be. And Tris helped him do that. So much of these books has been about overcoming fears. And isn't death the ultimate fear? Tris feared that her life would be taken away from her and Tobias feared that Tris would be taken away from him. Tris overcame that fear by choosing to take the risk of death, and Tobias faced Tris's death and came away whole--not unchanged but whole. That moment where he's ready to take the memory serum and Christina stops him, that was wonderful. It's that theme of how every moment and everything that we take in or see or experience in our lives impacts who we are--and sometimes we realize that, if we hadn't experienced all of the bad things we have experienced, then maybe we wouldn't make as good decisions as we sometimes do. It's important to know that both the good and the bad exist--and still to choose the good. I could keep rambling on and on, but I'd better start concluding. Do you remember watching Atonement? The sister writes a happy ending for her sister and the man she loved because she knows that they didn't actually get a happy ending. That's kind of what the end of Allegiant reminds me of. I don't want to pretend that there was a happy ending and I don't think I even want there to be one, but I want to imagine Tris and Tobias happy together, in an eternal moment. And when I picture that, I picture the happiness that they did have: when they first met, when left the city together, when they decided that they could stay together even through all of the rough times. And nothing can take away the significance of that time. Nothing can do away with the good decisions Tris made, to try and make sense of this inner world of factions and this outer world of governments and experiments and to still make the right decisions despite of everything. Nothing can do away with the help that she gave many people, or the way that she helped Tobias understand himself. There are so many explorations in these three books about what drives people and what is the best way to go about life. And while some of those questions are answered, there will always be more because these are details that humanity is always trying to struggle through. But what is most important is the note that this book ends on, that the good times are important to remember and if each person strives to have a positive impact, then everyone will be better for it. That is utterly powerful.